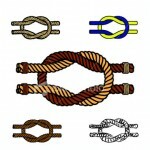 Subscribe to comments with RSS or TrackBack to 'Know your knots'. Great links. I like The SAS survival manual’s knot pages. They are very handy.